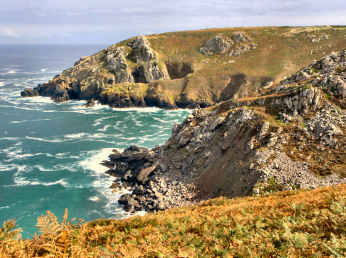 This is that magical part of Cornwall beyond St. Ives and Penzance and known as West Penwith. Cornwall, almost completely separated from Devon (and therefore England) by the River Tamar, is a peninsula in itself. West Penwith is the final peninsula, only four miles of land between Hayle and Marazion joining it to the rest of Cornwall. It looks and feels like a different world thanks to its strange juxtaposition of the relics of three widely separated historical periods. The prehistoric age has left behind stone circles, ancient graves, standing stones and village remains. The early Christian era is represented by Cornish crosses, chapel remains and holy wells. The early industrial period has left the most obvious relics: the engine houses and mine chimneys of the age of tin and copper, at its height in the 18th and 19th centuries. 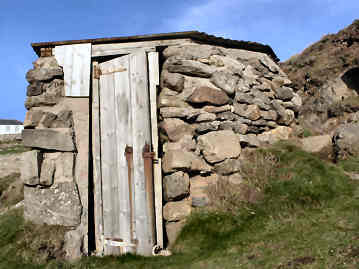 Inland rises to around 700 feet with tiny fields, with stone walls and hedges, grazed by cattle and sheep. Along the coast rugged cliffs rise to some 400 feet. 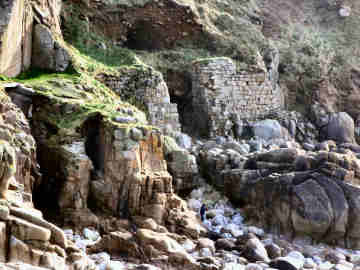 There are sheltered fishing coves in the south, few in the north. The coast path is some of the most enjoyable but also some of the most difficult in places. The path is not always clear and you may have to scramble over great rocks. Don't let that deter you, the scenery is fantastic. If you want to see the end of the world and enjoy rugged grandeur and the feeling that far over the horizon is America, forget much touted Land’s End: the crowds and theme park will completely spoil its grandeur for you. Instead go to Cape Cornwall by St. Just in Penwith, a mere five miles as the crow flies but spiritually a million miles away. This may not be England's most westerly point - Land's End is - but until only a hundred or so years ago most people thought it was. 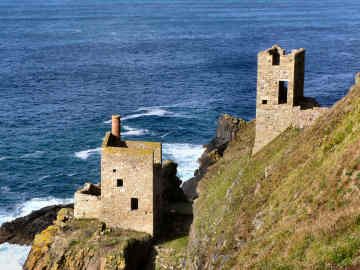 Follow the signs from St. Just village, park in the National Trust Car Park and use the National Trust West Penwith Booklet to explore the Cape and its environs, including Priest's Cove, the Kenidjack Valley and the Cape itself, topped by a mine chimney. Continue south beyond Priest's Cove and, close to the clifftop, you will find the remarkable Bollowal Barrow, a neolithic and bronze age burial chamber. Refreshments at Cape Cornwall Golf Club, Britain's most westerly; I strongly recommend the bacon and egg baps for great value. Spend time in St. Just itself for the impressive church, several art and craft galleries and teashops and pubs. We have enjoyed Cornish pasties at the pleasant but down-to-earth Star Inn and several shops sell a variety of good pasties. 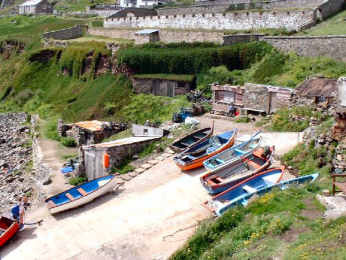 Tucked away from easy public view below the south flank of Cape Cornwall there is a remarkable survival, a tiny cove from which fishermen still scrape a living in small boats, harvesting crab and lobster and occasional hand-line mackerel. Small boats are drawn up on a slippery ramp, tiny huts slot into the cliffs and mesembryantheum grows rampant on walls and even over the huts; we had previously seen this on Scilly. 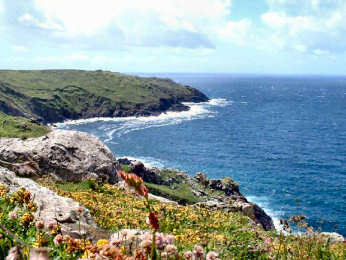 To the south of the cove are adits cut into the cliff for the former St. Just mine; above the north side are the terraces of a lost garden, created by local man Francis Oats, son of a miner, who as a boy walked to Penzance each evening to attend classes and rose to become chairman of the De Beers diamond empire in South Africa. 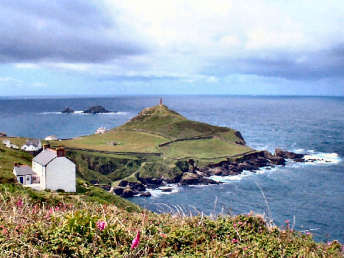 His home, Porthledden House (recently restored) stands high above Cape Cornwall; parts of his former walled garden can be seen at the top of the photo below left. 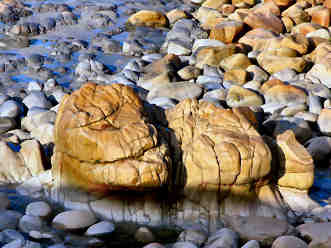 Walking the coast path between Cape Cornwall and Sennen, it would be easy to pass Porth Nanven by. It is worth seeing on two counts. First for its remarkable geology: in the two coves a wave-cut platform in the cliff shows where sea levels were once many feet higher; ancient sea-worn boulders from above have tumbled to the modern beach and are now protected by law. Second for the relics of ancient mining: climbing the hill up to Hermon Cliff are the pylon bases of what may have been an aerial ropeway; by the coast path on the cliff are many mine adits and old shafts; at the foot of the cliff is an old mine building - and a 16th century wooden water pipe from here is now in Geevor Museum.